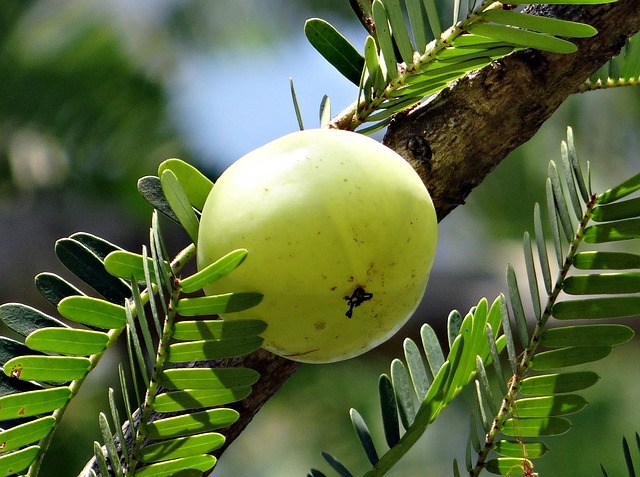 Amla also know as amalaki, dhatriphala and in Sanskrit and Emblica officinalis scientifically, is the most widely used herb in the ayurvedic system of medicine. It maintains balance amongst three Doshas of wind, bile and phelgm (Vayu, Pitta and Cough) and effectively controls digestive problems, strengthens heart, builds up and sustains defence mechanism, improves eye sight, imparts a natural glow to hair and body and a store house of Vitamin C.
The English name of amla: Indian gooseberry, denotes that it is indigenous to India. Though all parts of the tree have medicinal value, it is the fruit which constitutes the main drug. Charaka has specifically mentioned it as a great rasayana that helps protect people from disease and keeps away the manifestations of premature ageing. Amla fruit is acrid, cooling, refrigerant, diuretic, laxative, alexeteric, antipyretic, aphrodisiac alterant, tonic and trichogeneous. It is the richest natural source of Vitamin C. 100 gm. of Amla contains about 700 mg. of vitamin C, which is thirty times the amount found in oranges. In addition to Vitamin C, it also contains calcium, iron, protein, garlic and tannic acids, sugar, phosphorus, carbohydrates etc. The juice of fresh amla fruit is given as tonic, diuretic and anti-bilious remedy. It is also helpful in burning sensation, over thirst, dyspepsia and other complaints of digestive system. Amla strengthens the body, expel toxins from the body and improves defense mechanism of the body. It is an essential vitamin to improve eye sight. Weakness of body, heart and mind shall be dispelled by taking fresh amla juice in between meals. Massaging the head with amla oil, induces sound sleep and is good for hair. Prevents premature graying of hair. Wash eyes daily, in the morning with amla water, soaked in water and drink the water to improve the eyesight and remove constipation. Insert 2-4 amla juice drops into each nostril to cure bleeding for nose. A wonderful antioxidant and a natural Source of Vitamin C. Amla helps scavenge free radicals. Amla is powerful food for the brain. Studies show that Amla helps lower cholesterol. Amla also helps maintain the functioning of the liver. Increases Hemoglobin, Red blood cell count. Useful for Cough, Bronchitis, Asthma. Amla cleanses the mouth, strengthens the teeth. There are various classic ayurvedic preparations, such as chyawanprash in which amla is used as a chief ingredient. It help improve intelligence and memory power. Triphala and Brahmrasayana are other classic medicine in which amla is being used since time immemorial.